With the full moon visible in the clear blue afternoon sky, snow on the top of the Tararuas I left work early. Could I finally get over the Southern Crossing under the moon? For so long I had waited for the full moon, clear skies and snow all at once. I had to make the most of the opportunity. I packed my things together and headed for Otaki Forks. As I departed over the new Waiotauru footbridge I was on my way. I almost felt disorientated as I walked along the track "improvements" and past the digger used in their construction. I had been over this track tens of times before but, it now seems as wide than the Otaki Gorge Road that leads here. There were no concerns about freezing on this windless evening, and wearing a layer too many of polypro I was soon sweating my way up to Field Hut. The carnage and tree falls from the previous time I was here has been cleared from the track, but the remaining patches of thin tree canopy from that storm were notable. After a short break at Field Hut the ascent continued. I was soon on Table Top under the full moon and mostly clear sky. I was still hopeful of finding some snow as up to this point it has been noticeably absent. Approaching Dennan, I was finally into the snowline at about 1200m. I was having a great time in the snow under the moon. It was awesome. In the excitement and heavy snow I managed to via away from the established track, with, like my politics a slight left-hand bias. After a brief right-hand correction I was back on the established track and found the ice covered waratah posts marking the route. While approaching Bridge Peak, the clag was thickening and by the time I reached Kime Hut, the moon was barely penetrating through the clag. I stopped at Kime Hut for a brew, optimistically hoping the clag would clear, before ascending Mt Hector. With the tap frozen I was boiling snow, which was relatively rapid as I was only cooking for one. In larger groups I have found this much more time consuming in the past. After drinking my tea, the clag was even thicker so it was to be here that I would hunker down for the night. 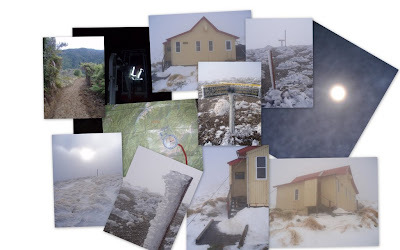 Wellington trampers often refer to Kime Hut affectionately as "The Fridge". Many claim it is warmer outside the hut than inside it. Arriving here in the middle of the night, surrounded by snow and with myself as sole occupant it seemed a good time to test this theory. Keeping my Casio Protrek watch away from my own body heat so as to accurately use its thermometer function. It is not warm inside Kime Hut, however, it is about one degree warmer than outside. When departing on Saturday morning, there was virtually no visibility so I was sure to take a compass bearing before heading back down to Otaki Forks. In fact, it was darker than much of the time I had traveled under the moon the night before. While I did not get across the whole Southern Crossing as I intended, I sure had a great time in the snowy winter wonderland. Try again, during the full moon next month? You can find more detail at Garmin Connect.